R News just released a special issue on the use of the versatile statistics program R in chemistry. It features six articles amongst which one by Rajarshi Guha on the CDK-R bridge, and one by my supervisor and me on the use of self-organizing maps to cluster crystal structures. I hacked in a new extension point for Bioclipse yesterday, based on a proposal I made earlier. The new extension point (EP) is called ChildResourceCreator and allows creating child resources for a given IBioResource. One application where this is very useful is the CMLRSS application (earlier blog), or any RSS or Atom enriched with any other XML language. Here, child resources are created for each feed entry resource with as content the foreign XML, e.g. the CML bits in the blog. Other applications involve complex documents, which is basically most existing documents. Take, for example, the PDB format from the PDB database. These PDB files contain a pletory of information including one or more protein structures, sequences and bibliographic information. Bioclipse supports each of those using the CDK, BioJava and JabRef libraries. By making extension for the ChildResourceCreator EP, I am able to setup a general PDBResource (with Bioclipse's syntax highlighted PDB editor), and child resources for the different bits of information. Bioclipse 1.0, however, only allow looking at the molecular structure(s) in the file, not at the sequence, nor the references. Will post the obligatory screenshot asap. Recently, a new generation of Chemical Markup Language CML users seem to hit the learning-curve-wall; there seems to be a niche in explaining the use of CML, so here goes. My new (third) blog will discuss frequently and less frequently asked questions about the use of CML. Trepalin et al. published in Molecules the article A Java Chemical Structure Editor Supporting the Modular Chemical Descriptor Language (MCDL) (open access PDF). The applet is about 250kB (though the article mentions 200kB) in size and downloadable from the MCDL project on SourceForge (license: Public Domain). 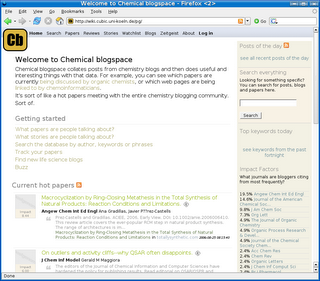 The article compares the applet with the JChemPaint applet and notes that their applet is much smaller. Both allow a template database for automated structure diagram generation, and the database that comes with the MCDL applet contains 105 fragments, whereas the JChemPaint applet contains a few. The article also discusses the algorithm they use to deduce bond orders, starting from the MCDL, a problem CDK is struggling with when dealing with SMILES strings. Bling! Bling!. Mark Wielaard announced the GNU Classpath 0.92 release, with the following changes: an alternative awt peer implementation based on Escher that uses the X protocol directly. Various ImageIO providers for png, gif and bmp images. Support for reading and writing midi files and reading .au and .wav files have been added. Various tools and support classes have been added for jar, native2ascii, serialver, keytool, jarsigner. A GConf based util.peers backend has been added. Support for using alternative root certificate authorities with the security and crypto packages. Start of javax.management and runtime lang.managment runtime support. NIO channels now support scatter-gather operations. This means new items on my TODO list: remove the dust from the CDK based test suite, test if Jmol, JChemPaint, Taverna still work, and report the outcome on the Classpath website. I wonder how the Cairo and Escher patches for AWT and Swing affect my favorite chemblaics tools. BTW, that the Classpath team appreciates such testing efforts is clear from the foto in the 'Bling! Bling!' blog by Mark mentioned above. 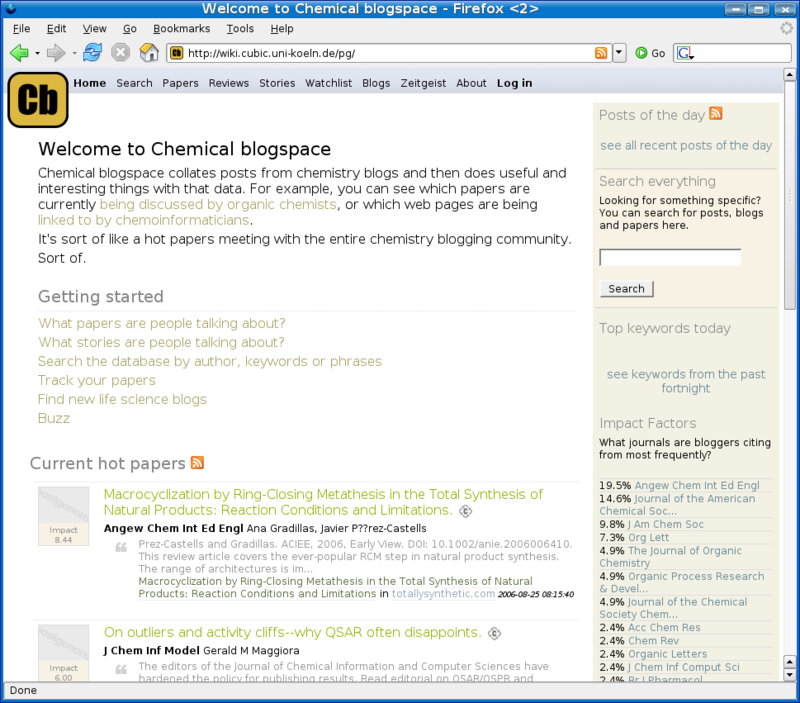 Mix one of the oldest and one of the latest computer technologies, and you get FoX (BSD license), a Fortran library for reading and writing Chemical Markup Language, and thus XML. Amazing, what Toby White achieved, though he did not start from scratch: "FoX evolved from the initial codebase of xmlf90, which was written largely by Alberto Garcia and Jon Wakelin." (source: cml-discuss mailing list). This afternoon I have hacked in constructors for ChemObject, Element, Isotope, AtomType, Atom and PseudoAtom that allow to be constructed from its interface, or the interface of one of its superclasses. Yesterday, I found this way a rather interesting Japanese blog, called ケムインフォマティクスに虚空投げ, which I still can't read, but which has a lot of small code fragments. (Can someone please translate the title for me??) The last 10-ish items discuss fingerprints calculation with the CDK and JOELib, some SMARTS work with JOELib, and some discussion on neural network tools. Recently, a second beta of Java 6 was released, which triggered a patch for the Debian java-package package. It was a Bioclipse bug report today, however, which made me patch my java-package setup and install the beta. So, next thing was to try to get the CDK compile with the Java 6 beta. Because our build system uses JavaDoc (anyone with a pointer with a easy to use Java parser, which parses JavaDoc too? ), and because this setup is different for literally every platform and Java version, the build.xml needed some tweaking (patch 6719 and 6721). Additionally, a number of source files were marked as needing Java 1.5, while they actually depend on features introduced in Java 5 (aka 1.5) and which are present in Java 6 (aka 1.6) too, so that needed some tweaking too (patch 6720). I have no idea what Java 6 will change and/or introduce, but I did note some comments on it being faster, which is always a good thing. The JUnit test timings seems to agree with this. While my Java 1.5.0_06 installation needed 204 seconds (no duplicates), Java 1.6.0_beta2 needed only 168 seconds (no duplicates), and improvement of 18%.